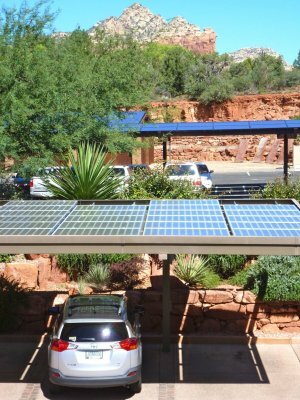 Over a dozen Sedona and Verde Valley residents will soon join the nonprofit American Solar Energy Society (ASES) and hundreds of solar-savvy groups nationwide to showcase solar-powered homes, schools and businesses as well as bonus "green living" displays and discussions. It's all part of ASES' 19th Annual National Solar Tour on October 4th and 5th, the world's largest grassroots solar event. The free local tours will be Sedona on Saturday October 4th from 9am to 4 pm and in the Verde Valley on Sunday October 5, from 11 am to 5 pm. Both tours aim to educate and inspire the public with diverse small and large scale examples of affordable solar technologies that can drastically reduce monthly energy bills as well as reduce greenhouse gases and other emissions from coal-based power plants. "We don't need to wait for better solar technology or more government incentives," says local organizer and green living advocate Susan Pitcairn. "Right now, with tax credits and zero-down options, almost anyone with a sunny roof and decent credit scores can buy or lease solar at a monthly cost less than their average electric bill. But I would not wait," she added. "The 30% federal tax credit expires at the end of 2016." A number of panel suppliers now offer finance plans through local installers, who have put up hundreds of new solar arrays on Northern Arizona homes. Several solar company representatives will be available at tour sites to explain the benefits, options and affordability of photovoltaics. Each site will be open for 2-3 hours only, in a geographical sequence. Pick up printed tour guides and maps from 9 to 11 am, Saturday October 5th at the first Sedona tour site: 529 Smith Road in uptown area at solar professional Lee Feliciano's own elegantly remodeled energy efficient solar home. From there the Sedona morning tour continues to 89a and Airport Road, where Dr. George Moore's will show his 190kw solar parking structures, featured on the cover of the national tour guide, providing enough energy to power 38 average homes. From 11 to 2 the tour then moves to 1865 Gun Fury (tour headquarters) for a free lunch and a wide variety of green living exhibits. There Feliciano will give also an objective overview of solar finance and technology options and several knowledgeable people will be on hand to walk you through solar and green living, including John Neville, former head of Sustainable Arizona. Afterwards, visitors can walk to a nearby Solar City home. From 1 to 4 the Sedona tour moves westward through three more solar and geothermal homes, including an owner-designed passive solar. It finishes at 15 Opal Court with an informal "Sustainability Salon" with new councilman Jon Thompson and four experts who have worked on solar and geothermal projects in the civic and business world. 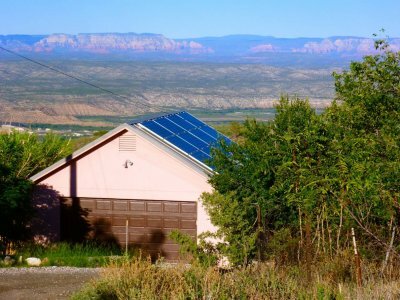 Sunday's Verde Valley tour starts in Jerome at 11 am with a solar home that is also for sale and finishes in Cottonwood at 5 pm. It offers the public a chance to meet installers from four companies and also features the award-winning Grey Fox Ridge (12 to 4), an energy efficient subdivision offering rooftop solar. From 12 to 2 Sunday the public is invited to pack a lunch to Riverfront Park's picnic shelter (east side),where solar designer T.J. Stockbridge will tell you about the city's all-solar plan for the $8 million Riverfront Water Reclamation plant to be built nearby. Stockbridge also designed the 800 kW system at Sedona Red Rock High School and several Cottonwood city projects noted as "drive-bys" on the tour. Downloadable schedules and maps of the two days of tours are at http://susanpitcairn.com/events. Or google "National Solar Tour" and use the online map on your phone. For more information contact Susan Pitcairn: 928-203-1095.